A lot of fans sure have taken a dump on the Prequels. And for good reason. They certainly don’t measure up to the stellar standards the Original Trilogy posted. And, yes, I am definitely part of the crowd that thinks the Prequels are huge stinkers when you compare them to the Original Trilogy. But that doesn’t mean the Prequels didn’t do anything right. There are at least three things the Prequels did right. When I wrote my piece on the best order on how to watch the Star Wars films, I essentially backed the “Machete” order. The Machete order means you’ll need to watch the first two films of the Original Trilogy (Episodes IV and V), then Episodes II and III of the Prequels as a flashback, then finish it off by watching Return of the Jedi (Episode VI). This means you totally eliminate Episode I: The Phantom Menace altogether since most of the scenes in that movie doesn’t tie into the overarching story. Sadly, if you do skip over The Phantom Menace, you’ll also not be able to listen to probably the most awesome song in Star Wars, Duel of the Fates. Star Wars definitely has some of the most memorable soundtracks. I could listen to the blaring dramatic main theme song all day. I could imagine myself being a badass walking down a hallway while pretending the Imperial March is playing on the loudspeakers. Duel of the Fates is just as good but, at the same time, separates it from the other Star Wars music; practically all of the other songs from Star Wars follow the same rhythm and volume. Duel of the Fates, however, starts out relatively slow and slowly builds up, becoming more frantic. Adding the chorus also makes it seem more epic as well. Too bad they only used Duel of the Fates in The Phantom Menace! Most of the new cast of actors pulled off really good performances in the Prequels. Sure, Ian McDiarmid’s performance as Chancellor Palpatine was deliciously cheesy but it suit the character. It was definitely much better than the wooden performances from Hayden Christensen and Jake Lloyd (shudder). But there was one shining performance from the new cast. A jewel that outshined all of the turd-like performances. That would be Ewan McGregor as Obi-Wan Kenobi. I can believe this is the same guy! 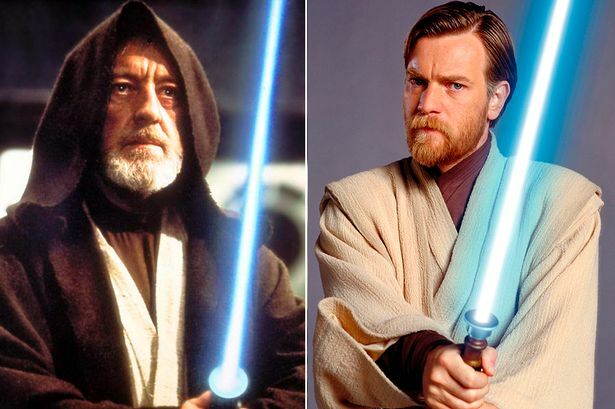 You see Obi-Wan Kenobi as a rather reckless Jedi-in-training in The Phantom Menace and then watch him slowly mature throughout the Prequels and, by the time Revenge of the Sith rolls in, you can see his transformation from youth to a responsible member of the Jedi council. A lot of it comes from Ewan McGregor’s acting ability. If you look at Ewan McGregor’s performance throughout the entire Prequel trilogy, he manages to capture Alec Guinness’ accent almost perfectly! And, even with the bad dialogue, the actor still manages to pull of a rather believable performance. You can see the anguish in his face when he has to take out Anakin Skywalker in Revenge of the Sith. Heck, you can hear how easy it was to use the Jedi mind trick on Elan Sel’Sabagno when the man tried to sell him “death sticks.” It’s like he’s done it hundreds of times that it’s just not interesting for him anymore! This is probably one instance where the Prequels outperformed the Original Trilogy. As much as I love the lightsaber battles in the Original Trilogy, they do look very lame and boring by today’s standards. I do understand the “logic” as to why they were choreographed the way they were. Darth Vader’s helmet made it virtually impossible for actor David Prowse to see what was happening so everything had to be very deliberate. Also, the idea behind lightsaber battles during the Original Trilogy was that it was like medieval knights fighting with broadswords. Hence, they would use two hand and one strike could end it all. They were tense but not action packed. The Prequels did “update” the Jedi lightsaber fighting style with a lot of stylized jumping and leaps. The lightsaber duels were incredibly fast paced, especially when compared to the original standoffish style in the Original Trilogy. This made the lightsaber battles much more exciting to watch. It did remove a lot of the tension but, hey, it was more action packed! The Jedis also made liberal use of their Force powers, which made them a joy to watch! With that being said, I have to, once again, set my expectations lower with The Force Awakens. The official “canon” reason as to why the lightsaber battles were more frenetic was because, during the time of the Prequels, the Jedis were at their prime. They were properly trained and all that. In the Original Trilogy, their skills have sort of deteriorated. So, if JJ Abrams follows the official canon story, I think we’ll be going back to the original “let’s tap our glowing sticks together” style of lightsaber battles. Oh, who am I kidding? I can’t help but be incredibly stoked for The Force Awakens! Don’t let me down, JJ Abrams! Were there any other things that the Star Wars Prequels did right? Let me know in the comments section below!